Varkala is a seaside town which is also known as Janardhanapuram and is well known for its ancient temple dedicated to Lord Vishnu who is known as Janardhana here. 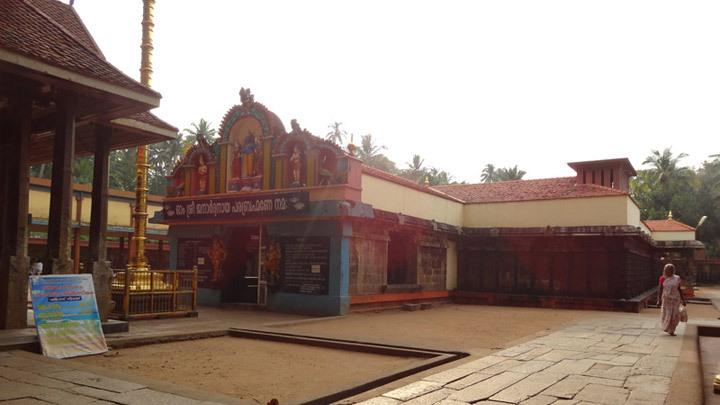 The shrine finds its name mentioned in Srimad Bhagavatam which says that Balarama had visited this shrine during his pilgrimage to Kanyakumari and other temples of South India. The place has a number of attractions which are unique and attract a large number of pilgrims and visitors throughout the year. The shrine of Janardhana Swamy is located atop a table land which adjoins the sea and is located on a hilltop which is reached only by a tiresome flight of stairs. As you reach the entrance of the main shrine, you are welcomed by the idols of Hanuman and Garuda on either sides, after which one would come to the main shrine which houses the idol of Janardhana with his consorts Sri Devi and Bhoo Devi. As per one of the inscriptions found at the temple, the shrine is said to have been renovated during the reign of Umayamma Rani who held power of this region from 1677 to 1684 AD. The shrine is said to be 2000 odd years old; however, the current structure dates back to the 12th century. As per legends, Narada after paying his respects to Maha Vishnu, left Vaikunta to further proceed to meet his father Brahma. Charmed by the music played by Narada on his veena, Vishnu follows him without being noticed. When Narada reached Brahmaloka, Brahma saw Maha Vishnu following his son and offered salutations to the lord. Realising the odd situation, Vishnu disappeared and Brahma realised that the person whom he had paid his respects to was his own son Narada. The Prajapathis began to laugh at Brahma's folly and was cursed by Brahma that they would be born on earth and would undergo all the suffering of human beings. As cure for the curse, Narada advised them to perform penance at a place, which he would chose for the same. For which he threw his Valkalam or bark upper garment into the air and at the place where it fell down, they built a shrine dedicated to Janardhana Swamy. Varkala is a corrupt version of Valkala and the name is popularly used. The current idol was found by a Pandyan king in the nearby sea. The king had a dream which directed him to go to the sea the next day and stand next to the crumbling temple from where he would see a huge amount of flowers floating in the waters. On searching around that spot, he would be able to find an idol, he was also given the instruction to make a golden hand and attach it to the idol, which was done. The idol of Janardhana Swamy has the aabhojana in his right hand. Devotees believe that his hand is slowly rising towards his mouth. It is said that the day when the idol consumes the aabhojana, the kaliyuga would come to an end and the world will be swallowed in a great deluge. One can find a huge bell at this temple which has the year 1757 marked on it, which probably might be the year in which it was made. The bell was offered to the temple as a gift to the lord, by the captain of a Dutch ship. While sailing to Europe, the ship refused to move as it passed by the temple, on hearing the ringing of a bell from the temple, the captain of the ship vowed that he offer the bell of his ship as an offering to the lord, if he permits the ship to continue its voyage. Soon a wind blew and the ship, along with its crew, safely reached the next port. The captain is said to have returned and fulfilled his promise by gifting the bell to the temple.